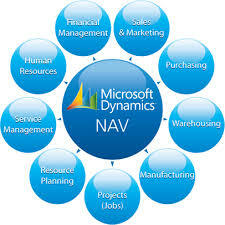 MS Dynamics NAV is today the world's leading Enterprise Solution for mid market enterprises. One of the most cost-effective and easily adaptable integrated business solutions that have helped companies in their quest to grow, MS Dynamics NAV has the largest number of implementations worldwide amongst its class of products. A true enterprise level solution, NAV (formerly Navision), has one of the lowest possible total cost of ownership amongst its category of solutions. Its unique architecture and efficient development environment ensure that unlike most other competing products, NAV (formerly Navision) customization and implementation can be completed quickly in just a few weeks and by small teams. With Microsoft Dynamics NAV you can implement proven industry-specific functionality relevant to your needs—even for the most highly specialized industries and organizations. The result? A cost-effective complete ERP software solution tailored precisely to your unique requirements—one that helps your employees be more effective and your company more competitive.